I always wanted to play the guitar but I was afraid. I was scared that I did not have the skill to play an instrument, and I was petrified of performing in front of others. I never learned to play a musical instrument as a child. My few attempts at playing the guitar as a teenager were disastrous, filled with anxiety. But I continued to harbor dreams of playing wonderful melodies before enraptured audiences. As I was about to turn thirty, however, I realized I had to either learn to play the guitar or shed these fantasies. So I signed up for guitar lessons. The results of this decision have changed my life in many ways. First, I met a truly inspirational teacher, Larry Long. 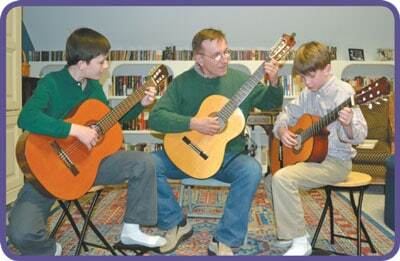 Larry has been teaching classical guitar in Knoxville for over forty years. He is also a prolific composer; his beautiful piece, Serenade for Guitar, has been recorded by many artists. He is by far the best teacher I have encountered in my life. He taught me guitar technique and the ability to read music. Furthermore, he instilled a love and appreciation of music. He is a very patient and positive teacher; for many years, I have modeled my own teaching technique after his example. Second, I learned about the history of the classical guitar. The modern six-string guitar began in Spain and Italy in the early 19th century. However, throughout most of that century, the classical guitar was considered an “inferior” concert instrument. Students at music conservatories studied piano or violin. Francisco Tarrega, performing and composing in Spain in the late 19th century, changed this perception. His arrangements of classical composers for the guitar, such as Chopin and Mozart, along with his beautiful compositions, such as Capriche Arabe and Recuerdos de la Alhambra, are still performed. Tarrega inspired Andres Segovia, a fellow Spaniard, who brought the classical guitar into the world’s concert halls in the 20th century. Third, I became involved in the classical guitar community. Thanks to the past efforts of Tarrega and Segovia, the classical guitar has artists and devotees throughout the world. The Knoxville Guitar Society sponsors monthly concerts that showcase this international talent. I became this society’s Director three years ago (for more information, pleases visit our website, www.knoxvilleguitar.org ). Through this society, I have developed friendships with local guitar enthusiasts, teachers, and the artists that perform here. Finally, I have watched my two young sons develop a love for the guitar and for music in general. As parents, we seldom know which of our interests will become our children’s interests. Now, when I hear both of them practicing, I hope that the guitar will become a lifelong interest. I am glad I signed up for guitar lessons many years ago. I think I proved to myself that, as an adult, I could still learn new things and overcome my anxieties. The classical guitar has changed my teaching style, expanded my knowledge of music, helped formed new relationships, and influenced my children. I have also learned to play great music on a beautiful instrument, a skill that will last the rest of my life.